Home Inventory Shrinkage How Much of Retail Shrink is Lost to “Paper Shrink”? Each year, loss prevention directors are evaluated based at least in part on retail shrink results. At a minimum, poor retail shrink numbers negatively affect bonuses and department morale. At times, unacceptable results may even lead to dismissal. Forward-thinking LP professionals, like golfers in search of the key that will elevate their game, continually search for that new technology, idea, or process that will lower retail shrink and help transform their departments from cost centers into profit centers. Toward that end, many retail businesses have implemented elaborate inventory control programs to reduce real retail shrink —the out-the-door inventory losses caused by employee theft, shoplifting, and vendor fraud. Sophisticated IP camera systems, sensor devices, exception reporting, and the like have cut retail shrink considerably. But even the most advanced loss prevention program can come up short if, in addition to uprooting the causes of so-called “real shrink,” the company does not identify and eliminate the causes of paper shrink. “Paper shrink” is the term applied to all discrepancies between physical inventory and book inventory that are not out-the-door losses caused by theft, shoplifting, or fraud. (Admittedly, it’s an older term, as much of this data is kept in spreadsheets rather than on actual paper these days.) Paper shrink results from incorrect counting or pricing, misdirected shipments, careless paperwork on the loading dock, and a range of other accounting and recordkeeping errors. One reason for the laissez-faire attitude of some retailers is that some paper shrink, such as that from missed markdowns, has a netting effect on profits. That is, these types of retail shrink are typically offset in other accounts such as cost of sales or the shortage appears as reverse retail shrink in the next period. But other paper shrink may cause real bottom-line losses. The primary reason to be concerned, however, is that unidentified paper shrink hits hard when it misdirects the efforts of LP programs designed to attack the real shrink. That is, if the company cannot identify its paper shrink, then it does not have an accurate handle on its real shrink. For example, to reduce exceptionally high retail shrink in a particular department, loss prevention may spend time and money guarding against theft, though theft may not be the problem in that department. If the retail shrink in that department results from administrative error and no one knows it, the company is wasting real dollars trying to catch thieves that don’t exist. By knowing more precisely the causes of paper shrink, companies can better determine the causes and sources of real shrink, more accurately measure its value, and more effectively use available resources in controlling retail shrink of all types. Put another way, the ability to identify and control paper shrink directly affects a company’s ability to determine and accurately measure the real losses that require corrective LP action and control measures. In fairness to loss prevention professionals, the resources and authority many of them have to work with are limited to theft-related causes of retail shrink —employee theft, shoplifting, and vendor fraud. But according to Tom Yake, a retail shrink expert who has helped the Internal Revenue Service and Security Exchange Commission examine shrinkage issues related to financial misreporting, there are more than 100 causes of retail shrink. Though the three theft-related causes cost retailers billions of dollars every year, the impact of the other causes can be substantial as well. By focusing only on theft-related sources, companies are ignoring pockets of poor policies and processes as well as errors in which retail shrink germinates and grows. In most instances, these operational problems can be readily dealt with. However, to be successful at uprooting and resolving these problems, companies require an LP program based on a more comprehensive view of retail shrink, a program that works from vendor to sales floor and from back office to front. 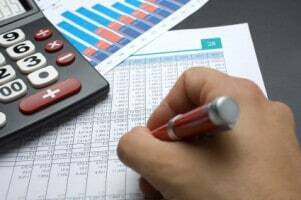 The sources of paper shrink—sometimes referred to as book shrink—will vary depending on whether the company uses the retail method or the cost method to account for its financial inventory. Some causes of paper shrink are associated with the retail method, some with the cost method, and others will affect retailers using either method. The following examples show how certain policies and procedures can result in the appearance of shrinkage in financial results and go well beyond the ability of the typical LP director and staff in terms of both detection and control. Price Changes (Retail Method). Company A, a grocer that over the years moved toward a more complex product mix, had procedures in place that were appropriately designed for the grocery business. For example, the company did not record markups or markdowns on existing inventory when price changes occurred. This practice is not unusual within the grocery industry, where the inventory turnover is so high the net dollar value of permanent price changes on existing inventory is insignificant compared to the total flow through of merchandise for each inventory period. However, for general merchandise, the impact on retail shrink of not recording markups and markdowns was significant. General merchandise is the goods for which the company’s inventory turnover was under three turns per year compared to over eleven for the rest of the categories. Cost of Goods (Cost Method). Company B’s inventory transfers from the distribution center to the stores were charged to the store inventory account at an item level, using the actual cost at the time the goods were purchased. That cost would naturally vary during the year based on new vendor shipments. The cost was further adjusted internally for advertised goods purchased by the store. Sales were converted to cost at an item level during the year using the cost at the time the item was sold. Because of timing differences between purchase and sale, an item may have been purchased at different costs. If the purchase cost is higher than the sales cost, the result may contribute to retail shrink (depending on the value attributed to that item during the physical inventory). On the other hand, if the sale cost is higher than the purchase cost, the result is a reported inventory overage. In Transit (Cost and Retail Methods). Another breeding ground for reported shrink at the store level is merchandise in transit. Distortions in reported store shrink can occur from improper timing in recording or from a failure to record transfers to and from distribution centers. In fact, not being able to reconcile in-transit discrepancies is another situation that may render a company unable to detect or quantify the true impact of retail shrink caused by theft. Figure 1. 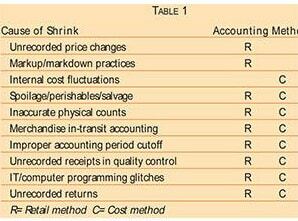 Cause of Shrink and Accounting Methods. Table 1 shows some of the non-theft-related causes of retail shrink and the inventory accounting method(s) associated with each cause. All are common in most retail situations and lie outside the loss prevention department’s normal sphere of recognition and control. Companies are certainly aware of these other causes of retail shrink, but loss prevention departments generally do not have control over accounting methods, distribution practices, and the other activities listed here. Nor do LP departments have the core skills and experience to identify, uproot, and correct these problems. Most loss prevention professionals are generalists who excel at dealing with the prevention and detection of theft, interviewing and interrogating, and the development of training and awareness programs. But few of these managers are experts in the varied aspects of the paperwork component of retail shrink. Their traditional activities and limited resources—which match management’s expectations—keep them busy elsewhere. This is not to say that LP professionals are not a valuable resource and key part of a retail organization, because they are indeed critical. But their lack of control over many factors influencing retail shrink and the lack of certain skills put most loss prevention departments at a disadvantage. They are, in effect, handcuffed. For the loss prevention group to really affect retail shrink, it needs, at a minimum, representatives from the finance, accounting, inventory control, merchandising/buying, distribution, IT, customer service and human resource organizations in its camp and focused on the issue. How can a company address all of the shrinkage components with the right skills and do so cost effectively? The best way is through the formation of proactive retail shrink committees or teams. Some retailers form loss prevention committees to deal with specific inventory shrinkage issues. In most cases, however, these are ad hoc committees formed to respond to a specific process or systems issue brought to the company’s attention when some mistake has been identified. These committees are frequently short-lived and lack the authority needed to effect change. While they may resolve individual problems that have been identified, many others go undetected. But what if a company had a standing committee, a proactive team to ferret out the less-obvious retail shrink issues? A team that worked to improve control processes? A team that uncovered and corrected new retail shrink problems as they occurred? A loss prevention team with the right kinds of skills and management associates can root out the errors and practices that may go undetected for years, lead to sizable paper shrink, and throw a protective shroud over the true measure of real shrink, enabling it to grow. Senior management must endorse the project and commit the company to its success. The right people from the right departments must become active members of the team. These include representatives from areas such as finance, operations, merchandising, logistics, information systems, inventory control, and accounting. These individuals must be given sufficient authority to modify policies and procedures as needed to combat paper shrink. The senior management team must hold all members of this proactive team accountable for the company’s retail shrink results. This article was originally published in 2002 and was updated June 6, 2017.